Background: Understanding of the restriction of HIV-1 transcription in resting CD4+ Tcells is critical to find a cure for AIDS. Although many negative factors causing HIV-1 transcription blockage in resting CD4+ T-cells have been found, there are still unknown mechanisms to explore. Objective: To explore the mechanism for the suppression of de novo HIV-1 transcription in resting CD4+ T-cells. Methods: In this study, a short isoform of Per-1 expression plasmid was transfected into 293T cells with or without Tat's presence to identify Per-1 as a negative regulator for HIV-1 transcription. Silencing of Per-1 was conducted in resting CD4+ T-cells or monocyte-derived macrophages (MDMs) to evaluate the antiviral activity of Per-1. Additionally, we analyzed the correlation between Per-1 expression and viral loads in vivo, and silenced Per-1 by siRNA technology to investigate the potential anti-HIV-1 roles of Per-1 in vivo in untreated HIV-1-infected individuals. Results: We found that short isoform Per-1 can restrict HIV-1 replication and Tat ameliorates this inhibitory effect. Silencing of Per-1 could upregulate HIV-1 transcription both in resting CD4+ Tcells and MDMs. Moreover, Per-1 expression is inversely correlated with viral loads in Rapid progressors (RPs) in vivo. Conclusion: These data together suggest that Per-1 is a novel negative regulator of HIV-1 transcription. This restrictive activity of Per-1 to HIV-1 replication may contribute to HIV-1 latency in resting CD4+ T-cells. 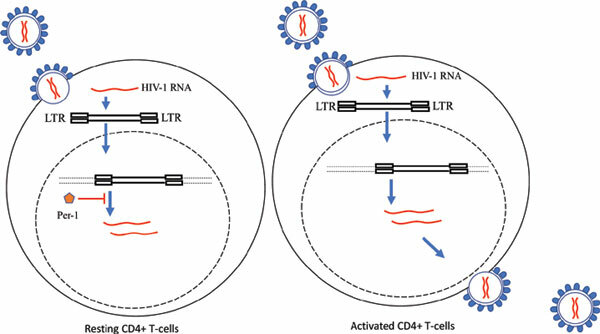 HIV-1, resting CD4+ T-cells, Tat, LTR, viral load, RPs, LTNPs.